Strong trading to close out last week puts us into week 12 of the current uptrend. A shorter window of opportunity this week, with U.S. markets closed Thursday, and open until 1pm EST on Friday, for the Thanksgiving Holiday. The U.S. market indexes remain in good shape with respect to their moving averages. 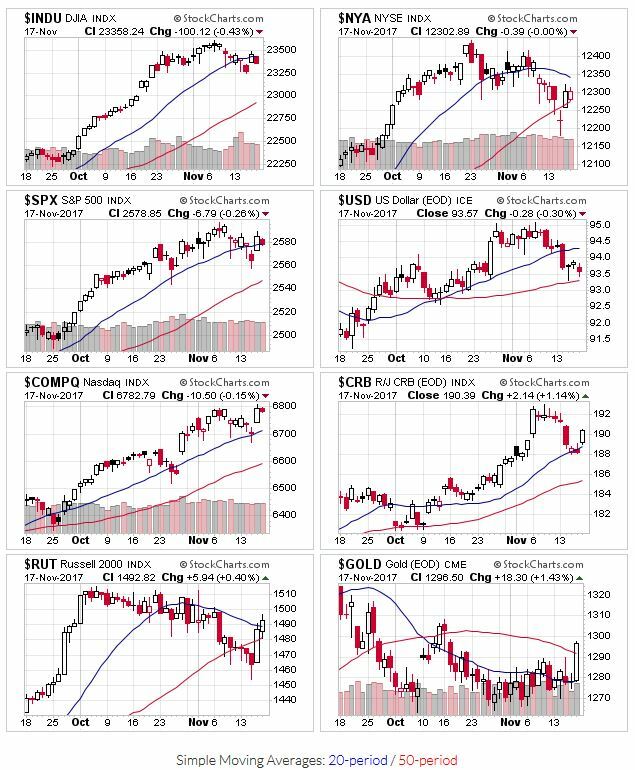 All the indexes are above their 50 day moving averages, and the Dow Jones and S&P500 start the week below their 20-day moving averages. The Russell 2000 closed below it’s 50-day 3 days in a row last week; a potential warning sign, as it has been the weakest of the indexes. But a strong Thursday and Friday session enabled the Russell to reclaim both the 20 and 50 day levels. The NYSE also faltered last week, and now rests on the 50-day. Price and volume action is still okay; not too good, not too bad. As mentioned last week, flat bases remain the most abundant chart pattern for growth investing, so be on the lookout for high quality set-ups (5 week minimum, high volume breakouts, etc.). And finally, OEW shows the uptrend is still intact.